The planet Mars has long fascinated mankind. In the late 1800s and early 1900s, scientists such as Percival Lowell believed based on telescopic examination that there was an advanced civilization on Mars. Later telescopic and spacecraft studies revealed this to be incorrect, and the Viking landers in 1976 could not even find evidence of microscopic life. Although Mars may be biologically dead, it is a geologically fascinating world, with the largest canyon system and volcanos known in the solar system. 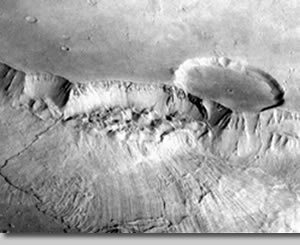 These slides illustrate many different types of geologic features on Mars, including tectonic structures, volcanos, impact craters, landslides, and features formed or modified by ice and water. Although humans have not yet set foot on Mars, scientists believe that several rocks from Mars are available for study on Earth. These rocks, known as the SNC meteorites, are also examined here, as are the two small moons of Mars, Phobos and Deimos. The locator chart (Fig. 1) shows the location of these images on Mars, keyed by slide number. The white regions in Fig. 1 are topographic lowlands, and the stippled regions are highlands. The black regions are major volcanos, and the Valles Marineris trough system is shown with heavy dots. Latitude and longitude coordinates for the center of each image are given in each caption. As on Earth, 0° latitude is the equator. On Mars, longitude is specified in degrees west of a reference longitude chosen by the International Astronomical Union. In general, Viking Orbiter images are not oriented with their boundaries precisely north-south and east-west. Most of the slides in this collection are oriented so that north is along the top portion of the slide. In a few instances, the slide is oriented with some other direction to the top of the slide in order to provide a clearer view. This is indicated in the appropriate captions. A glossary of important terms is included with the slide set. Words that are defined in the glossary are linked to their definitions from their first appearance in the captions. Most meteorites found on Earth are believed to originate in the asteroid belt. However, in the early 1980s, scientists recognized that certain meteorites probably originated on Mars. These are known as the SNC meteorites, which is an acronym for the names of three such meteorites, Shergotty, Nakhla, and Chassigny. These meteorites are named for the places on Earth where they were found. As of October 1997, 12 such martian meteorites have been recognized. Eleven of these meteorites are relatively young in a geologic sense, having formed as volcanic rocks between 180 million and 1.3 billion years ago. The oldest of these rocks, discovered in Antarctica in 1984 and known as ALH 84001, formed 4.5 billion years ago, shortly after the time that Mars itself is believed to have formed. Allan Hills 84001 shows evidence of being affected by many later events, including liquid water flowing through it at some time. In August 1996, a team of researchers at NASA Johnson Space Center and at Stanford University announced that this rock contains evidence for ancient life on Mars. The evidence for this claim consists of the chemical details of deposits in the rock and microscopic structures that might be fossils. This claim is controversial, and many scientists are now examining this rock in even greater detail to determine whether or not life actually did exist. For further information, visit the LPI's Mars meteorite Web page. Walter Kiefer, Allan Treiman, and Stephen Clifford are all staff scientists at the Lunar and Planetary Institute. Dr. Kiefer's research interests focus on the internal structure and evolution of the terrestrial planets, particularly Mars and Venus. Dr. Treiman's research interests include the chemistry of meteorites and the structure of the martian crust. Dr. Clifford's research interests focus on the distribution and behavior of water on Mars.